The 32-bit version of Quad-Dir have small problems under x64 but Q-Dir x64 works without problems on Wndows, 10, Windows 7, XP or Windows Vista x64. 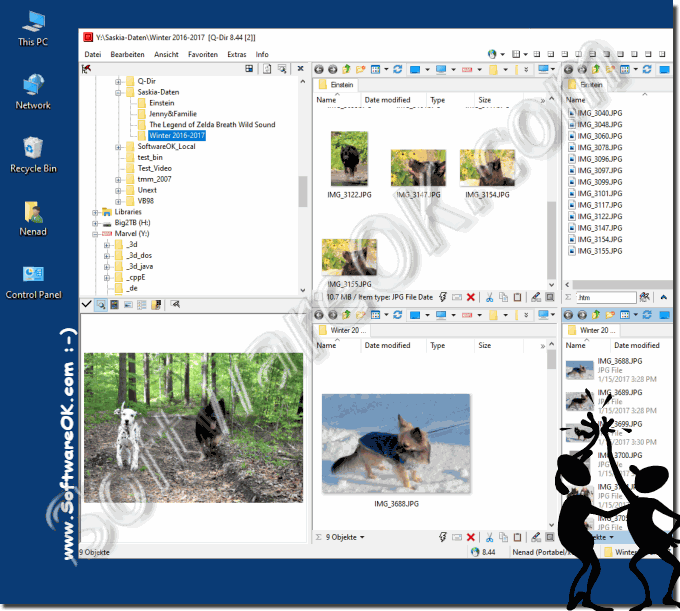 (Image-1) The File Manager Q-Dir on OS Windows-10! Q-DIR - FAQ-52: Quad-Dir and Windows x64. How does it work? My suggestino is that the xplorer2 has just one better function which is enabling upper folder just double-clicking blank side. Please add that function into Q-dir for perfect folder browser. Does Q-Dir have the ability to go "Up a directory level" with a double click on a blank spot in the pane? If so where can I turn this feature on? If not, consider this a request...:) So many other explorer replacements have this option, and Q-dir NEEDS it!